Sometimes you will get students with speech disabilities. 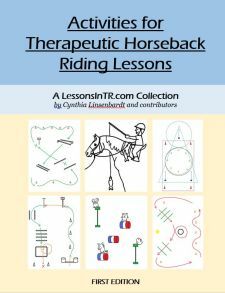 While the TR Instructor is not a speech therapist – your purpose is to teach riding skills – there are certain adaptations you need to make and things you can do to help communication. I wanted to share some resources I have found so far about working with such students. These are tips from “How to Develop Effective Communication Strategies and Tools for each Participant” by Susan Lutz from Region 5 conference handouts, and from the PATH Intl. workshop I attended. Don’t ignore attempts to communicate. Give words for their non-verbal attempts. Be honest when you don’t understand – ask them to repeat, show you, spell, or say it in another way. Try singing! They may sing or hum along, as it is enjoyable and they don’t feel put on the spot. If nonverbal, use cues such as nodding yes or no, tapping for stop and go (it helps to ask what cues they do at home or at school). Check with parent or caregiver about how the rider expressed pain, frustration, discomfort, having to go to the bathroom, etc. Train your volunteers in the communication methods you are using. Treat them as completely capable of understanding and communicating. See more communication techniques at my other post: Communication Techniques for Low/Nonverbal Riders! Again, the TR instructor’s role is to teach riding skills, not speech. If you are teaching skills that include verbal cues, or using games that involve speaking, here are some tips for addressing such words with speech disability students. 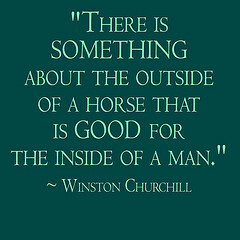 remember that in the end, the best thing for your rider is being on a horse. The sensory benefits can last 2-4 days (source), so even though you’re not incorporating speech, the benefits of the horse’s movement last long enough to impact what they are doing with their Speech Therapist and parents at home. do a good amount of warming up to stimulate the rider’s body before incorporating lots of words. The horse’s movement encourages deep breathing, correct posture, and trunk, neck and jaw control, all of which are needed for speech. Consider giving the rider time for their body to wake up via the horse’s movement before asking them to talk a lot, depending on how the rider responds. focus on alignment! As the video Speech and Hippotherapy highlights, this is key to producing sound. through the parents contact the rider’s speech therapist and ask for home activities you can do with that specific child that would support what the speech therapist is doing. Any cues or prompts you use in lessons must be consistent with those the child’s speech therapist uses with them or it could cause problems. if you are working with the rider’s speech therapist, you might incorporate the same cues he or she is using with your rider, as they direct you. Don’t try using them on your own volition. If you don’t know what touch cues are, here are some examples for learning purposes only. Remember, as a TR instructor you teach riding skills, so speech is not your focus. Do not claim to be able to do speech therapy or produce results of improved speech from your instruction. Make sure the parents know this, and make it clear you’re not a licensed speech therapist. If their goal is for you to improve their child’s speech, recommend them to a hippotherapy program instead. Objective: Student will demonstrate leg aids for walk on (along with verbal “walk” as previously learned) 100% of the time with 1 leader and 2 sidewalkers at ankle hold, with minimal verbal prompts. Do you have any thoughts or experiences to add?